This post is the first in a series featuring each chapter of the Ad Altare Dei program. Methods and techniques are those of the author and we welcome other ideas and practices. Please leave your comments below. Both Scouting and the Catholic Church make use of meaningful symbols; physical items like uniforms and vestments worn in ceremonies to hand symbols like the scout sign and the sign of the cross. In Chapter 1 the Scouts learn about the meaning and importance of symbols used in every-day life. In preparation for the chapter, gather a collection of Christian symbols or sacramentals like a crucifix, rosary, pray cards, holy medal, candle, statues and water. Get the Scouts active by passing them around and asking them to share what type of sacramentals are used in their homes or by family members. The tangible experience makes the meeting more engaging and invites the Scouts into spontaneous conversation. 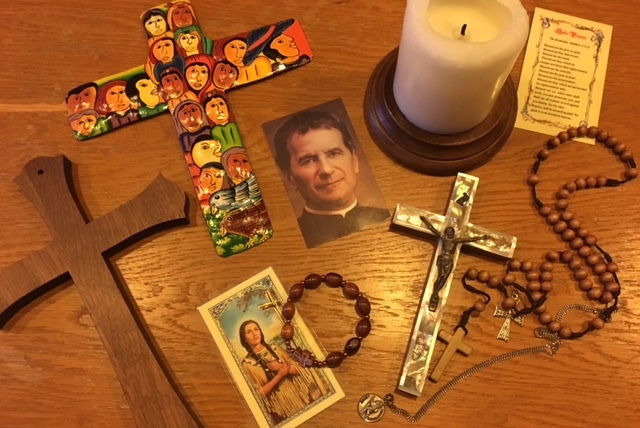 Don’t be surprised when a scout shares stories about their grandmother’s rosary or candles. Having your meeting in church, or meeting after Mass, you could take a walking tour to get close-up with the paschal candle, baptismal font, statues, stations of the cross and other sacramentals in the parish. Each sacramental is a sign and reminder of our faith and point us back toward the sacraments which are outward signs instituted by Christ to give us grace. Scouts recognize that there is something important about sacramental objects. By making the connection between sacramentals and the scout uniform and sign, the Scouts understand how these signs help define who we are as Christians and Scouts. The signs and symbols mold our behaviors and attitudes and point us to the ideals of the Scout Law and Christian life. 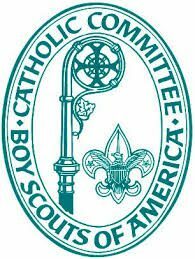 If your Scouts have use of smartphones, you can use a portion of your meeting time to have them make a video explaining the meaning of symbols in scouting and sacramentals in the Church. Homework: There are 3 puzzles in this chapter, which include the crossword in Appendix A. Assigning these as homework or pre-work will allow you to spend the most time discussing signs and symbols. The last part of Chapter 1 states the requirement to attend a retreat or day of recollection while working on the program. This does not need to be completed before continuing to the next chapters. The Archdiocese of Chicago Catholic Committee on Scouting hosts a Day of Recollection in the fall each year. See the website for details. Please share your ideas and practices on symbols and sacramentals. Chicago Catholic Committee 2017 | All Rights Reserved.